Home | Cooke Insurance Center, Inc. Welcome to Cooke Insurance Center, Inc! 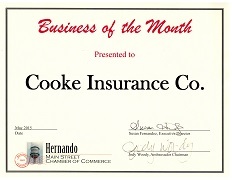 Cooke Insurance Center, Inc has been your dedicated insurance agency, serving the community of Hernando since 1915. As your local source for insurance services and solutions, our entire staff prides itself on offering personalized and responsive customer support to our customers throughout the Hernando area. Although our primary area of service is located in Hernando, Mississippi, we offer unparalleled service and competitive quotes to clients throughout the entire State of Mississippi! At Cooke Insurance Center, Inc, our ultimate goal is to create lasting relationships with each of our clients so that we may continue providing excellent service for many years to come. The Cooke Insurance Center, Inc Team is committed to providing clients with the highest quality insurance plans available combined with some of the lowest rates available in all of Mississippi. Whether you’re shopping for auto insurance, home insurance, health, life or business insurance, we can help get you the best coverage available with the lowest rate possible. Cooke Insurance Center is proud to be an independent insurance agency so that we can provide our policyholders with the highest levels of quality and value. We offer you security and peace of mind no matter where your life’s path may lead. So, don’t buy your own insurance without first talking to an independent insurance agent who has your best interests at heart and is committed to finding the right insurance coverages for your individual insurance needs. For auto, home, business, life, and health insurance, contact Cooke Insurance Center today so we provide you with the peace of mind you need.